Learn the basics in an individual session that will get you started on what we hope will become a new lifelong interest. One hour gets most people started, but many choose to come back for follow-up sessions to extend their skills. Also suitable for those tackling a specific project or pattern needing a spot of guidance. ​Right and left handers catered for. Sessions take place in the shop or studio and are arranged on weekdays and Saturday afternoons. £20 for an hour. Just phone us on 01608 645970 or call in to book a session. 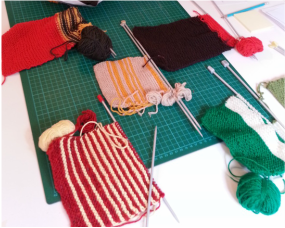 Book a session with the Knit Nurse who will help unravel your knitting problems and set you back on track. Typical problems might include difficulties with a pattern, mastering new techniques, dealing with mistakes, etc. We recommend booking a time slot. £20 per hour: time charged pro rata, ie 15 minutes = £5. An introduction to the highly addictive art of sock knitting. Over the course of the session, we'll work on your first mini sock and tackle all the essential skills: knitting in the round, turning the heel and grafting the toe. A set of sock needles to keep will be supplied as well as a choice of yarn and a pattern to get you started on your first full-size child or adult pair. This class is best suited to knitters who are already fairly confident.